His name is Koichi Sanders. He and the Colonel were divided at birth, despite not sharing a common mother nor being born in the same country or year. After that tragic separation, they never saw each other again, but for in the distant redness of Red land. They live in Red land, which is why the space behind them is always red. Their uniquely black and white faces cause them endless shame, as everywhere they go they are mistaken for each other. This is a big problem, since they do not even speak the same language! 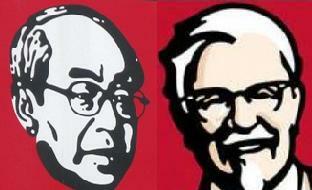 Koichi Sanders considers the Colonel ‘the other’ Sanders, and vice versa. Brothers from another mother, divided at birth. Koichi has been trying to market himself as professional recently. I think he is trying to distance himself from ‘that other’ Sanders. On his other ads (broadcast live from Red land) he also says- I am far more professional than ‘that other’ Sanders, who we all know is an unprofessional chicken-guzzling fiend. I prefer the amateur chicken maker. It is more greasy and yummy. 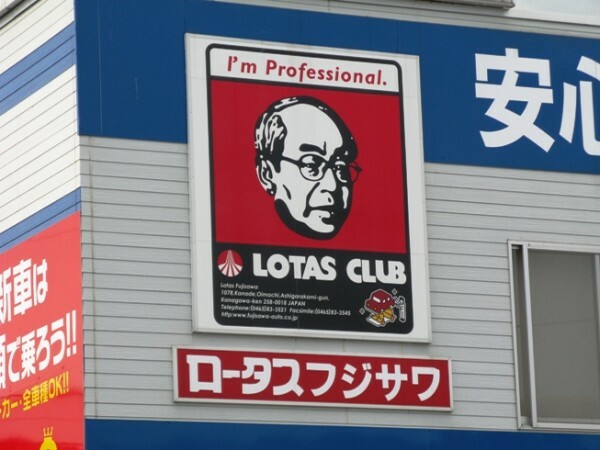 So is this Koichi fella selling fried chicken at his Lotas Club…and what is a Lotas Club…gambling, poker? What is Red Land? Mom- I don’t know what the Lotas club is- but certainly Koichi doesn’t sell chicken there- he despises all chickens, living or dead. Probably he gives lessons in professionalism and charges exorbitant rates and serves aperitifs for dinner with sparkling mineral water from France. Red land is where he and the Colonel live, where everything is Red- hence the Red backgrounds. Genny, the Colonel is about as red as a banana- he told me so himself in those exact words last time I stopped by Redland.